Great value, clarity and punch from a portable 1x12" combo. The RM-220 combo features a comprehensive Pre Amp, with a classic 5 band EQ, an all-new compressor, plus footswitchable Drive and Sub Harmonic effects. A newly designed Class D power section and specially designed Ashdown 1 x 12" speaker help keeps the weight down. Other features include a mini jack auxiliary input with level control, FX loop, XLR DI, Speakon/Jack combination out and a jack input for an (optional) FS-2 footswitch. The all new MAG RM range is the solution for bassists who need affordable and dependable light weight power houses that present real low-end power. 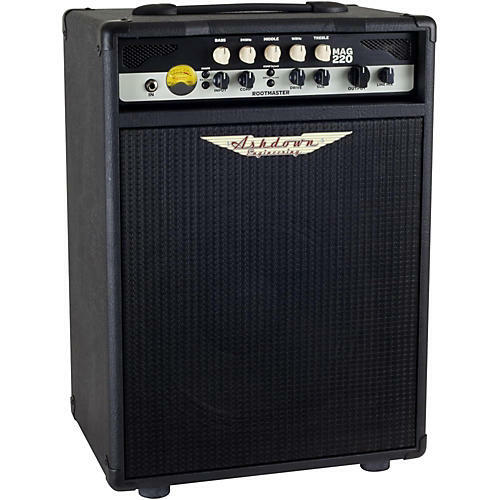 For players who dig the mid-range punch of a compact combo, the RM-MAG-C112-220 pairs a single 12" Ashdown bass speaker with a powerful 220W solid state amp, creating a compact powerhouse combo loaded with Rootmaster tone-shaping features. With footswitchable flexibility, its tube-emulated overdrive can take your core bass sound and push it into warm overdrive through to distorted filth whenever you need to add extra grind and girth to your tone. The perfect amp for myriad situations. Order today. Dimensions: 21.2" x 15.3" x 13.1"